Johan Steene outlasted a deep field of competitors to run a staggering 283.335 miles in 67:48:36, setting a new course record. A common scene at Big's Backyard, Gavin Woody catches some Z's between laps. Photo by Will Thomas. 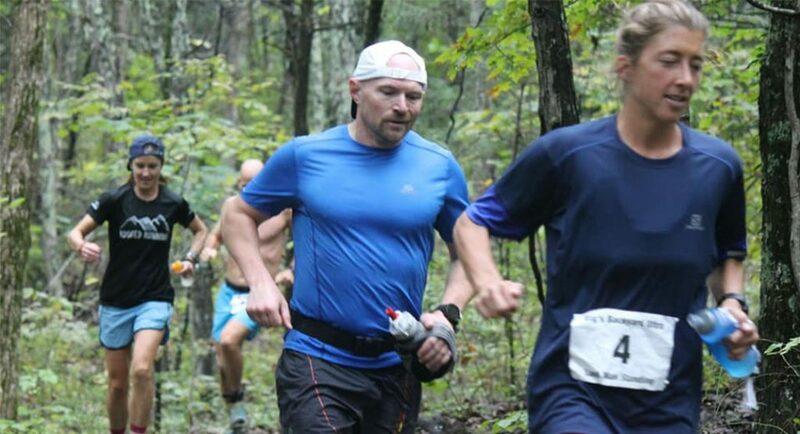 Everyone knew this year at Big’s Backyard Ultra was going to be, well, big. 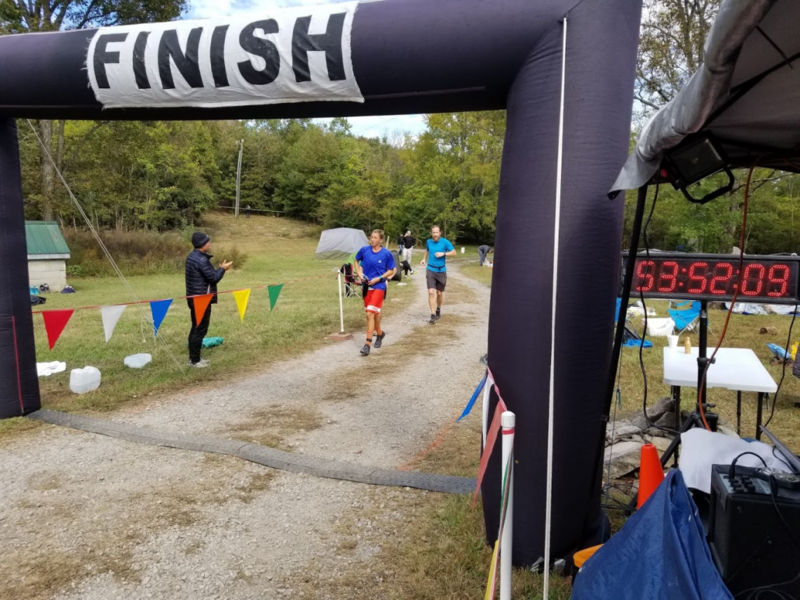 Since 2012, Lazarus Lake, the infamous race director who relishes in the pain of others, has been quietly hosting runners for his last-man-standing race on his property in Bell Buckle, Tennessee. The format is simple: Runners must complete a 4.16667-mile loop every hour until only one hardy soul is left. Whatever time they bank before the next hour begins is theirs. So it’s not a race of speed but rather a war of attrition where all but the winner DNF. 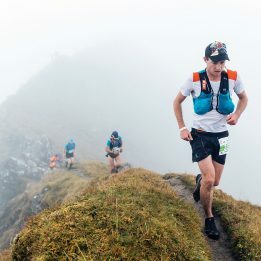 Last year, a duel between Guillaume Calmettes and Harvey Lewis ended with Calmettes running 245.835 miles in 59 hours. The feat drew considerable attention for the race and attracted a highly competitive field for 2018. Among this year’s main attractions were a returning Calmettes, Courtney Dauwalter, (2018 Western States women’s champ and 2017 #2 Ultrarunner of the Year by Ultrarunning Magazine), Cassie Scallon (winner of the 2011 JFK 50 and 2013 Lake Sonoma 50, among many others), Maggie Guterl (third fastest female trail 100-miler holder), Greg Salvesen (Infinitus 888K record holder and winner of the 2018 Jackpot Ultra Running Festival 48-hour run) Joe Fejes (American six-day mileage record holder), Johan Steene (former course record holder) and David Johnston (four-time winner of the Iditarod Trail Invitational 350). Runners head out on an early lap, still smiling. Photo by John Price. 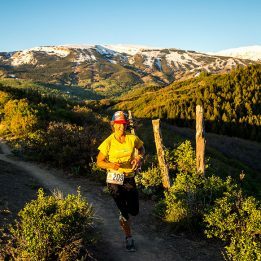 With such a strong field of ultra-distance and multi-day runners, the event was sure to go longer than the previous year. The question on everyone’s mind was, how long? 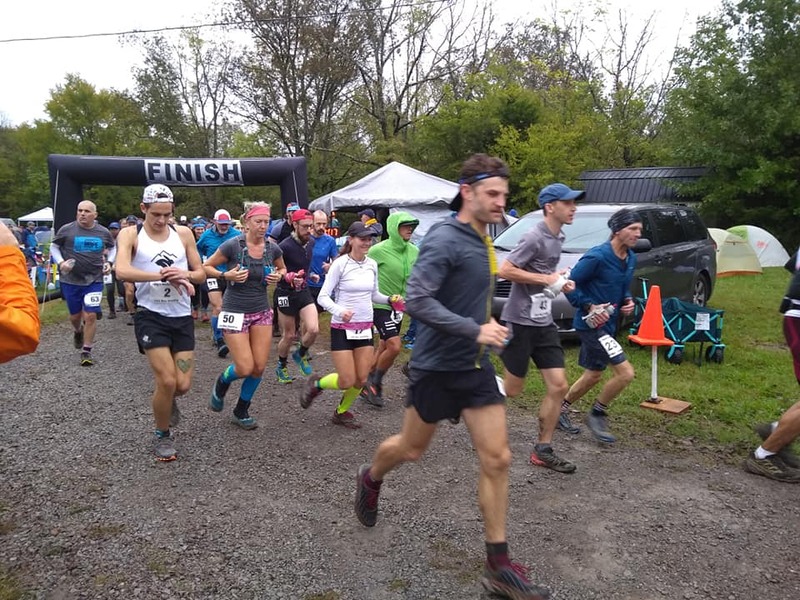 Mild temperatures on the first day, October 20, made for a record number of runners lasting the first 12 hours of trail. At that point, the race switches to an out-and-back on road for 12 hours overnight. Of the 70 starters, an impressive 53 made it to the road the first day, double last year’s number of 26. Between laps, runners were comforted by the race’s newest addition: The Jeerleaders, a group of three girls who would chant uplifting cheers like “Q-U-I-T, if you just quit then you’ll be free” just 30 seconds before many of the loops began. Freezing temperatures overnight became the main test for runners who huddled under blankets or near camping heaters. With daybreak came a return to the trail for the 30 remaining competitors, now 100 miles in. 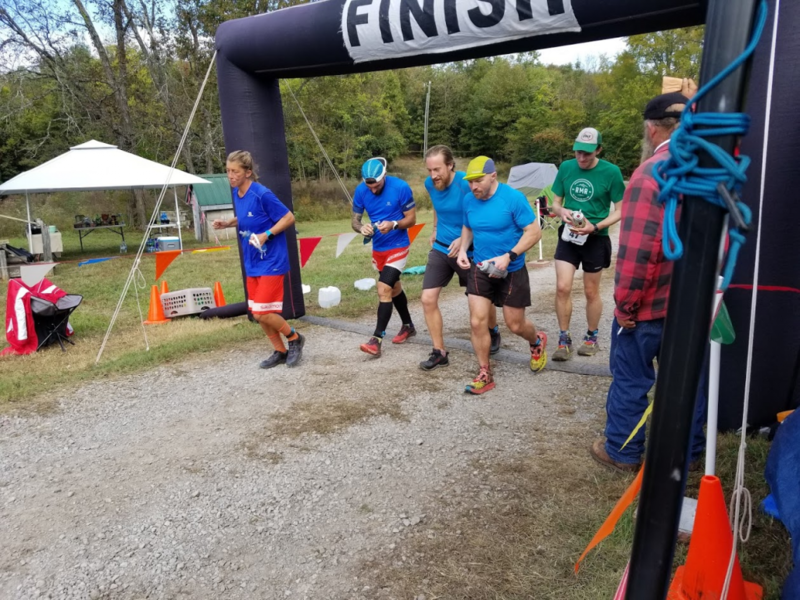 Injuries, sleep deprivation and pure despair picked off runners throughout the next day and night, leaving a “fab five” of survivors who saw the dawn of day three and 200 miles: Calmettes, Dauwalter, Steene, Gavin Woody and Salvesen (Woody won the 2017 Arrowhead 135-miler). By this point, it seemed certain the race would go beyond 300 miles. Dauwalter looked as fresh and happy as she had from the first lap. The reigning champ, Calmettes, still sported his signature French-laced optimism. Woody looked unstoppable. Only Salvesen appeared to be hanging on for dear life. And then there was Steene. In the 2014 edition of the race, he battled Jeremy Ebel one-on-one. Eventually, the race went so long that Steene was going to miss his flight back home to his native Stockholm. He ended up dropping at 204.183 miles to catch his flight. Ebel did as well, out of sportsmanship. But despite setting a new course record, both subsequently lost the race since neither man outlasted the other. This year, his aviation woes continued when his flight to the US was turned back to Sweden after six hours due to mechanical issues. He was able to get on another flight but then missed his connection in Washington, DC, thanks to long lines at immigration. Arriving in Nashville the night before the race at 11pm, he rushed to Walmart to buy his supplies. (The race offers no aid so runners must provide their own for however long the race persists.) In his hurry, he forgot to turn on his headlights and was pulled over by state troopers. Only after mentioning that he was headed to a “race put on by the same guy that does The Barkley” did he get off with a handshake and a warning. Gavin Woody follows Courtney Dauwalter through part of Big’s backyard. Photo by John Price. The three returned to the road and the cold at the 60-hour mark. Despite being 250 miles in, all looked remarkably strong. 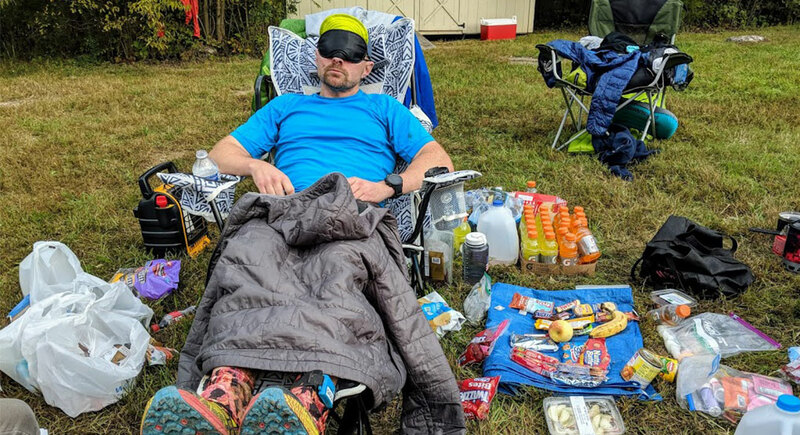 Between laps, each runner would curl up under blankets, eat and then immediately fall asleep in an attempt to squeeze in a few minutes before the next lap began. Most people in camp went to sleep that night feeling sure the race would reach 300 miles by morning. But hours later, Woody succumbed to destroyed quads. He hobbled back several minutes after going out on his 66th lap and had to be carried back to his chair by his crew. That left Dauwalter and Steene in the final shootout. At this point, they had run from Saturday morning into Tuesday. Smelling blood in the water, Johan threw down two fast loops, returning to camp before dominant Dauwalter. Until then, she had consistently beaten him back. 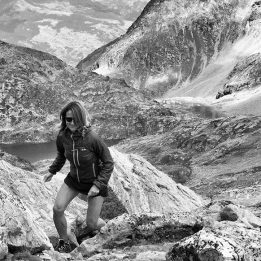 “When I noticed that I could keep up with Courtney on the road, a much stronger runner than me, and even push her a bit,” remembered Steene, “I guessed she was really hurting.” It was enough. Dauwalter came in from her 67th lap looking shell-shocked while clocking her slowest lap in three days, a 53:26. At the beginning of the next hour, when both were to return to the starting line to begin lap 68, only Steene ambled out of his makeshift tent. With mere seconds remaining, Dauwalter slowly stumbled towards the starting line. But rather than step into the starting corral, she extended her hand and congratulated Steene. The two embraced. And then, Steene slipped into the darkness alone. He completed his 68th lap to log 283.335 miles in 68:48:36 to finally become the last man standing in Big’s Backyard.